As Susan Berman explains how to make the seed packets, her voice is knowledgeable, while her hands gracefully cup the small seeds. Her homemade YouTube video educates viewers on something dear to her heart: gardening and growing food. Raised in the Toronto suburbs on a half-acre piece of land, Susan’s small backyard plot was the focal point of her childhood, “as important as breathing.” Her passion for gardening remains alive today. But when her health problems began, she realized that access to gardens and fresh food can’t be taken for granted. In the mid-1970’s, Susan became ill with an ‘invisible disability’, now diagnosed as fibromyalgia and Chronic Fatigue Syndrome. With intensive rehabilitation and the loan of a neighbour’s scooter, she learned how to navigate the city and return to her community. Then in 2007, a vertebra in Susan’s back was crushed, which led to another long bout of rehabilitation. These cumulative health issues made Susan revisit her old passion from a new angle. She began to investigate the physical barriers in gardening environments; she also widened her focus to understand how income levels limit access. Now, in 2011, Susan volunteers as the full-time coordinator for 30 plots in Symington Avenue Park. Her gardeners come from a wide range of cultural backgrounds and income levels: multiple varieties of calaloo and bitter melon, from India, China, and the West Indies, attest to the diverse roots of the community. This approach extends to those with more complex needs. Susan shares the story of Edward, a community gardener who suffered a stroke that greatly limited his mobility. In order to accommodate him, the garden applied for and was awarded a grant to add a wheelchair ramp to the tool shed. So, this year, Susan has asked that “Access” be the central theme for Toronto Seedy Sundays. Originally started as a seed exchange with a focus on heirloom, heritage and organic varieties, Seedy Saturdays and Sundays were founded by Seeds of Diversity Canada in the early 1990’s. The event has since spread across the country, hosted by grassroots organizations in dozens of communities. For gardeners, green-minded and food-focused folks, the annual event heralds the transition from winter planning to spring planting. Now in its fourteenth year, Toronto Seedy Sundays and Saturdays are hosted by the Toronto Community Garden Network (TCGN), and draw over 2,500 people and 50-plus vendors. This year, the event will take place at three locations: in Hart House at the University of Toronto, in North York and in Scarborough. In 2009, the event theme was Potatoes, and in 2010, Native Plants: simple symbols that recognize ecological diversity. This year, the organizers wish to highlight the diversity of gardeners. “Our aim is to encourage community gardens in Toronto to be even more inclusive and mindful of those with special needs,” Susan explains. Gardens as centres of health and learning have been gaining ground in Toronto. Innovative examples include the Spiral Garden at Holland Bloorview Kids Rehabilitation Hospital, and Sunnybrook Hospital’s horticultural therapy program. The City of Toronto’s High Park Children’s Garden is learner-focused and kid-friendly, as are the Teaching Gardens at the Toronto Botanical Garden and the programming of Green Thumbs Growing Kids. Casa Loma has likewise broadened its scope, with a sensory garden that focuses on touch and sound. This is where community gardens come in, as well as the work of Toronto’s non-profit food and garden organizations. 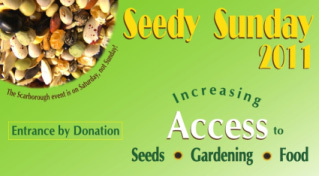 Many of the organizations on the Seedy Sunday planning committee are longstanding advocates for access, including The Stop, FoodShare, Evergreen, Live Green Toronto, North York Harvest Food Bank, Greenest City, Toronto Green Community and Scadding Court Community Centre. Melissa Benner is a writer and educator based in Toronto. She is also coordinating this year’s Downtown and North York Seedy Sundays. For event details, please visit www.tcgn.ca.